Viewing post in Cannot convert to sprite with Unity 2018? A new update was rolled out that should address this problem. Let me know if you run into any other issues! 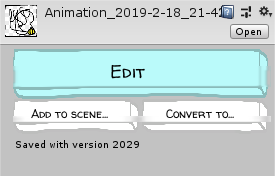 DirectoryNotFoundException: Could not find a part of the path "E:\Unity projects\TheCity\Assets\Assets\Textures\Drawn\Animation_2019-2-14_23-6-31.png". just wanna confirm that you tried deleting the old doodle studio folder and downloading the latest package. the double assets path is definitely the problem and something that was directly fixed in the latest update, let me know! I deleted the whole DoodleStudio folder, installed the new version and reimported my whole project twice. I haven't tried testing it in a new empty project, though. Not sure if anything can be left over in assets or library somehow... I can try a completely new project and install later today. I just made a completely new project in Unity 2018.3.6 and imported the plugin and I still get the same error.